Wow, this whole huge window display just for the Apple watch. And this is just one window @theofficialselfridges I think there were about 30-40 window displays like these on Oxford street. Apple surely has big marketing budgets. If you love the book as I do – you will probably like the play as much as I do too! I bought myself a birthday present and hoped this fantastic book translated well to stage. And it did! The cast was fantastic, it had great stage design and the story worked very well. Very recommended if you are in London! London’s newest bridge will be a garden http://t.co/Uqap7w4UlW. London gets NY highline like bridge, how fantastic. I nearly want to move back now. Just because I think they are wonderful. Especially the old Routemasters. Yes it can be a busy system (and yes sometimes they strike!) but I find it a great system and compared to public transport in Amsterdam – London is way ahead. And hey they have tube trains every few minutes – forget about that in Amsterdam. The time of the year might have something to do with it but there hasn’t been much on lately has there? And just living around the corner from it. Plays with dream actors like Kevin Spacey, Ken Stott, Charles Dance, Derek Jacobi. And I wish I could say Bill Nighy, but blimey what does one need to do to get that man back on stage in London! I love to hear the Brits talk. Good job I have a UK colleague at my current workplace so I won’t complete miss the British sense of humour and self deprication. Yes men wear suits in Amsterdam too, but it is just not as classy. Far from in fact. Oh and people with manners and being polite. My god – Dutch people are horrible when it comes to that. Lots of elbow and pushing work going on every single time I have to enter a train. And they don’t know how to behave on an escalator either. I have not drunk a single one of those since my return. Somehow that is such a quintessential British thing that it feels wrong to do it in the Netherlands. And Dutch tea just doesn’t taste as good as Yorkshire tea. You might think that I am missing London badly and regret having moved from there. But strangely enough, apart from the above list, and maybe a couple of other minor things, I haven’t missed London that much actually. There is no doubt in my mind that I have taken the right decision to move back to the Netherlands. Living close to my family again is really nice and life is just not as hectic (and therefor more healthy) as it was in London. I am still on a quest to find a perfect place to live though. I am currently living in Haarlem (renting) where I have the unbelievable luxury of having my own kitchen, with own micro wave, cooker and fridge. And six (six!) whole kitchen cupboards for myself! I am still getting used to it, having lived in a shared household for more than four years. So on that front, life is certainly improving. But Haarlem might not be the place where I am going to stay very long though. We’ll see what happens. Oh, and here is a new (and this time decent as my mum filmed this) video of Gijs the Hedgehog. He is still a regular visitor in the garden! How about a post that actually does justice to the title of this blog? 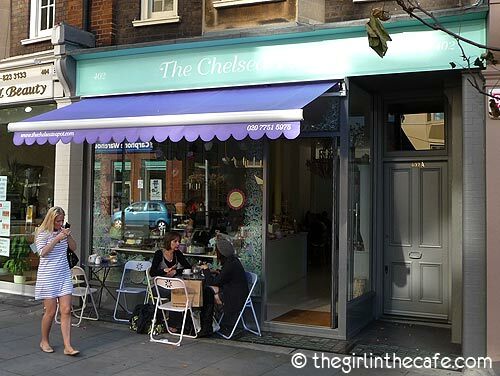 I was a little early for my Saturday film and on my way to the cinema I passed The Chelsea Teapot. It is a relatively new cafe (they have been around for 3 months now) and it looked so lovely I had to step inside and have a tea there. The weather is so incredible in London at the moment that I decided to bike to Regent’s Park after work, to catch the last sunshine. 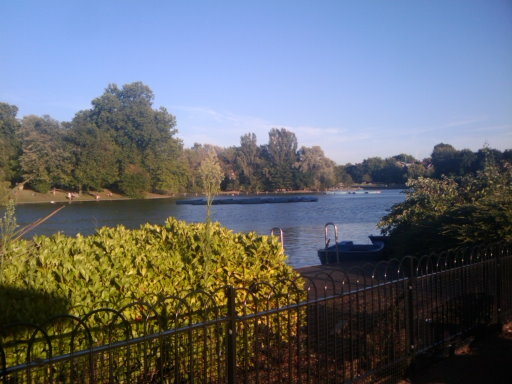 I think that Regent’s Park has become my favourite park. It is often peaceful, I love to watch people struggling in the boats on the boating lake and today I found the Boating Lake Cafe where they sell ice cream! Yes I had one. I just felt I needed to stress down a bit and realise that all will be fine with my trip. Of course I will find the hotel in LA and of course I can still check in in my hotel in San Francisco, despite arriving very late by train. Right? So I am going to relax about it now. I am typing this on my G1 Android phone, testing if it is possible to post to my blog from it. I will have wifi in my hotels so this might be a way to send trip updates. The camera on this phone isn’t worth much but good enough to give some sort of visual impression. I am also considering doing some podcasts with Ipadio which is something like Audioboo but available for Android too. If I am not too shy I will post it through my Twitter stream. I will enjoy the last bits of sunshine now here in London and hope the weather is as lovely over where you are. My mum visited me this weekend and with the weather being fantastic we have been outdoors a lot. Among a lot of other things, we did a lot of cycling! Wednesday, 9th September will see Londoners create music on the streets with their bicycle bells as the second annual Ding Day takes place. Designed to add a little fun to a cyclists day, the concept is simple and open to everyone. All that is needed is a bike and a bell. The idea – to make cycling London streets a joyful and happy experience. On Wednesday 9th September whenever you see another cyclist you give a little ‘ding ding’ on your bell, and they will return your greeting with another ‘ding ding’. From sun up to sun down, no matter where you are in the saddle on Ding Day, remember to ding your bell. To create a fun experience for cyclists and locals in and around London, with the hope of creating more of a sense of community amongst fellow cyclists, including commuters, parents, children, basically any cyclist young or old. It’s free and open to everyone. It is a celebration of cycling as one of the most environmentally friendly, healthy and quickest way of getting around our great city. More on the Ding Day home page / Ding day twitter / Ding Day Facebook. On my biking trip through Regent’s Park on Saturday, I suddenly found myself in front of a giraffe. Or rather two of them! 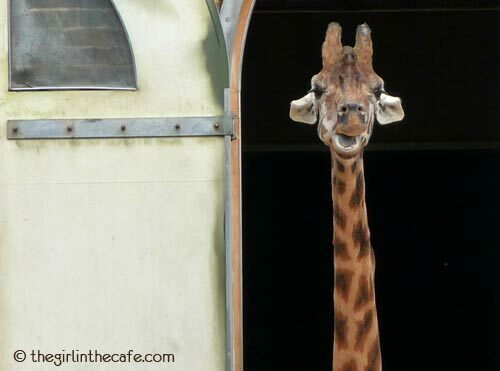 I knew that London Zoo is located in Regent’s Park, but I had no idea you could see the giraffes this closely from the road. I would also like to add that I don’t recommend you to visit the zoo, despite it’s beautiful location in the park and next to the Regent’s Canal, to see Gideon in this tiny confined space broke my heart. How bored he must be. Gideon does live quite close to me, so I intend to visit him regularly. Ralph the penguin gets sunburn wetsuit. And better, he seems absolutely delighted to swim around with it. Lucky a two month old duckling faced being put down because of a fracture on her leg, but a very good hearted woman refused to give her up. She asked a cobbler to make a sandal for Lucky so the duckling was able to swim. Lucky is now a happy duckling again. And see the video here. Yesterday the evening weather in London was so nice that I took my camera and positioned myself on Piccadilly Circus for a while. I took loads of photos but only found a couple of them worthy enough to go on display. I tried ghost people before in New York, but you can do that in London too, look at these Ghost legs in front of the bus! And there is the brave bicycle lady (without helmet mind you!) who claims Piccadilly circus for herself for a moment right in the middle of the cars, buses and cabs madness, wonderful. And there is bus number 19 in motion and I love, love, love this photograph. You can just about recognize the shape of a cab coming around the corner. I probably don’t follow any of the how-to-take-a-photograph rules, but sometimes you just need to take your camera and play. You can be surprised with the results. The shop is located on Marylebone Highstreet (a 5 minute walk from Baker Street station and not too far from Oxford Street either) and attracts both the very posh and the very down to earth (and everything in between), and both the very young (children) and the somwhat older. I have sold everything from children’s books to old school Wagner LP’s. There are the regulars who are waiting for the shop to open to be the first to check if anything interesting has arrived. And there are people who just wander in without really wanting to buy anything but then come to the till with a huge stack of books. “I really didn’t want to buy anything today” they then say, “but there are so many good books in this shop”. It’s nice hearing that. Two lovely DJ’s sitting down on the floor going through the boxes with vinyl record for ages and buying a stack of them. Vinyl is stil hip I tell you. Not only for dj’s, also classical music LP’s are still sold. And I have even sold some prerecorded casette tapes! VHS videos are still sold. Yep. I admit that the DVDs (and they have Bill DVDs too – I saw Hot Fuzz coming in yesterday …) are more popular but there is a good offer on VHS tapes: 3 for £1. There, how cheap is that? And I sold The Freewheelin’ Bob Dylan LP to a very friendly American. I had a talk with him about the fact that LP covers are so much cooler than cd covers. We talked how a carefully selected stack of albums carried under your arm could define just how cool you were. This American could not resist the temptation of owning The Freewheelin’ Bob Dylan on vinyl again. And he didn’t even have a record player at home he said! It is quite amazing to think about the fact that every single book in this whole shop (and there are many many books!) has been donated by someone. It is heart warming when people come into the shop with bags of books they want to donate. And they can use everything, so please come in and bring the books (or music) you no longer need. Kids love to sit down on their knees on the floor in front of kids section reading a fairy tale or looking for Harry Potter. It is lovely to see all those people wander around in the shop, browsing for books. The shop does have quite a selection, and there is something for everybody. 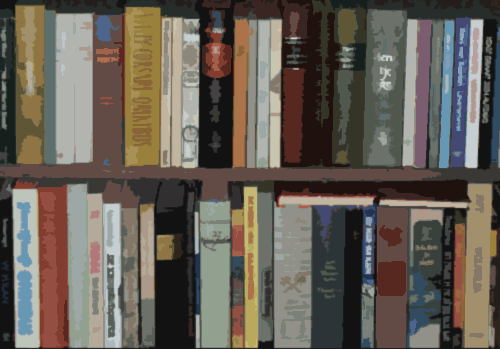 From easy to read chicklits to novels, literature, and books about science, gardening, films, London history, trains, planes or automobiles. There is a pretty good Travel section too, and when I saw this San Francisco guide come in (in mint condition and for only £2,50) I of course had to buy it. Have I spotted any celebs in the shop? Yes I sold a book to the singer of former UK band The Fine young Cannibals. Never a dull day in the book shop! I will be back working in the shop next Sunday so come in and say hi if you happen to be in the neighbourhood. Taken while sitting on my bed yesterday. 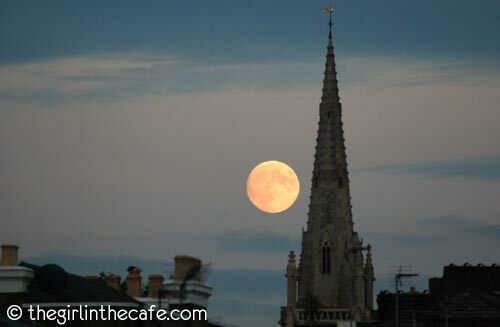 The moon looks huge, doesn’t it? We loved G-Force. I mean what is not to like, it’s talking guinea pigs! And mice! And a mole! And it is Bill in 3D. Apart from the slightly over the top Transformers like scene it was very enjoyable. The guinea pigs look great and I am sure children will love it. And we really liked The Proposal too. Ryan Reynolds is perfect for rom-coms, and there is a really cute dog in it too! One of the best rom-coms this year, together with Last Chance Harvey. And we found the best ice cream shop in London. Look no more, here it is : Gelato Mio. They have 3 shops, one in Notting Hill, one near Trafalgar Square and one in Holland Park. They are worth a visit, really. Are any of my regular readers on Facebook? Please connect! I stumbled upon the first on on Leicester Square where girl was playing a classical piece, and when I visited Portobello Road last week there was an older man playing a beautiful piece of music. 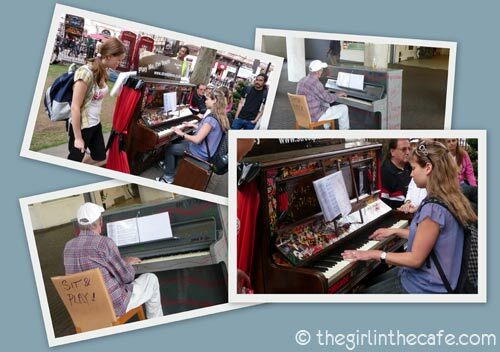 He had parked his glass of beer on the piano and went for it, impressing all bystanders. What a wonderful idea. On another note, the Fourth Plinth on Trafalgar Square has been turned into a living Art work. In stead of having a statue or sculpture there, living people, one at a time, one hour at the time, are taking stand on the plinth and do whatever they want to do making a living portrait of the UK. There is a live webstream here: One and Another website. 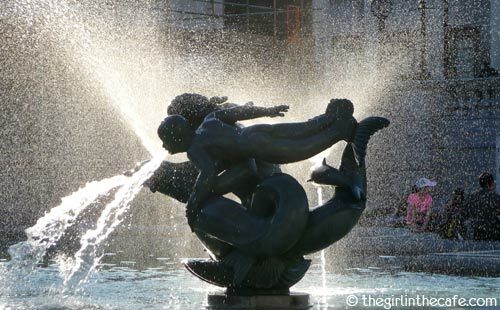 Or if you are in London, go visit Trafalgar Square, the event will continue until September. You can also apply for a place on the Plinth, should you be interested! The live webstream is kind of fascinating. A heatwave has arrived in London. I wonder if this is typically British, a heatwave warning with different levels and all. Sounds like the perfect weather for a move to me. Good thing I hired removal men for it. I used my weekend to pack everything and I am ready to go. Tonight I will meet up with Angus and the first time with Paolo, my other flatmate and we will get the keys. I hope it is going to be a smooth move, and that I will be happy there. I had planned to meet quite a lot of people tonight who wanted to have a look at the two rooms available in my current flat, but I fear that the planned tube strike from 7pm tonight might mess things up a bit. Just when I started to worry about that, my Italian landlord called, he is currently in the UK and said he was in no hurry at all to get the rooms filled. So I guess that means I will stop looking and he can sort it out himself. Which is good news – no more effort required from me then, me thinks. My IKEA sofa bed has been sold and will be picked up on the 28th of June. I have ordered moving boxes and will start packing soon. to find a reliable man with a van who can move the boxes to the new place on the 1st of July. Moving date still set for the 1st of July which is 22 days from now. It can’t go fast enough for me. Last Chance Harvey with Dustin Hoffman and Emma Thompson. Decent chick flick rom (and a bit of com) and recommended. Out now. Yeah it is still on, so we couldn’t help ourselves. We visited the Camden Stables (market). I had been to Camden before but I never made it to the stables section and we liked it. They also have a very nice area where you can sit down with your coffee and get something to eat from one of the many food stalls around. We opted for a pancake with nutella/banana. Not bad we can tell you! 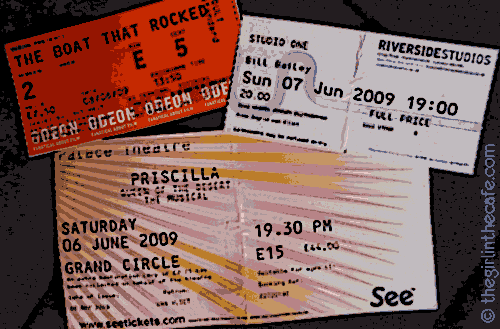 We saw Priscilla Queen of the Desert – the musical And can be short about this: go see it! It was fantastic, great music, fantastic cast and an evening full of fun. An absolute joy to watch. On Sunday we went to see immensely mad, crazy, hilariously funny Bill Bailey in the Riverside Studios. He did two tryouts in London before going on tour in the rest of the UK and I laughed my socks off. He is so funny. Catch him if he comes to a place near you. We also enjoyed the view from Parliament Hill (Hampstead Heath), had a coffee in the cafe with the most incapable staff on Leicester Square (All Bar One – please don’t go there they are totally rubbish), had lunch while having a nice view over the Thames in Greenwich, and checked where Lord Sandwich hung out in the National Maritime Museum (free entry). We had a great weekend! And you?